Pottery is the ceramic ware made by potters. It has been found in nearly all ancient, historical sites in many parts of the world because it does not decompose once it has been fired. It is made from a natural, organic material called clay. When the formed clay has all the water it contains removed first by drying, and then by firing in a kiln, the hard, permanent piece seems rock-like. When it is covered with a glaze made up primarily of glass, and then fired at even higher temperatures in a kiln, it becomes impregnable. In everyday usage the term pottery encompasses a wide range of ceramics, including earthenware, stoneware and porcelain. The places where such wares are made are called potteries. 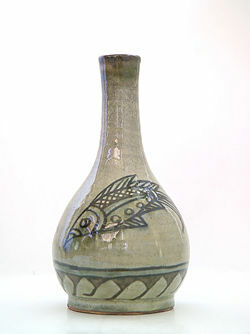 Pottery can be classified as artistic, commercial or industrial. Clay is decomposed and aged granite and consists mainly of alumina, silica, and water. White clay or kaolin clay is considered the purest and most basic clay, while other clays contain varied organic and chemical elements which produce a variety of colors and qualities valued by different artisans. Pottery is formed by one of three ways: thrown on a wheel, molded by hand without mechanical aids, or made with liquid or "plastic" clay using molds or other industrial tools. After the pot is shaped from clay, it must dry out completely in the air before it can be heated or fired in a kiln. When a pot is heated to high temperatures it shrinks considerably as the chemically bonded water leaves the clay at about 1,100 °F and reactions are created that lead to permanent chemical changes, including increasing the strength and hardness of the pot, as well as setting its shape. There are wide regional variations in the properties of clays used by potters, and this often helps to produce wares that are unique in character to a locality. It is common for clays and other minerals to be mixed together to produce clay bodies suited to specific purposes. For example, a clay body that remains slightly porous after firing is often used for making earthenware or terra cotta flower-pots, while less porous pottery may be used for cooking and eating. Additives can be worked into the clay body prior to forming, to produce desired effects in the fired wares. Coarse additives, such as sand and grog (fired clay which has been finely ground) are sometimes used to give the final product a desired texture and to decrease the amount of shrinkage of the pot as it dries. Grog also adds to the strength of the clay body. Contrasting colored clays and grogs are sometimes used to produce patterns in the finished wares. Colorants, usually metal oxides and carbonates, are added singly or in combination to achieve a desired color. Fine sand or bentonite is added to increase the "plastic" or malleable quality of the clay which then allows it to hold its shape better. Combustible particles can be mixed with the body or pressed into the surface to produce texture when it burns away in the kiln. The potter's most basic tools for forming clay are the hands, but many additional tools have been developed over the long history of pottery manufacture, including the potter's wheel and turntable, shaping tools (paddles, anvils, ribs), rolling tools (roulettes, slab rollers, rolling pins), cutting/piercing tools (knives, fluting tools, wires) and finishing tools (burnishing stones, rasps, chamois). Handwork or handbuilding. This is the earliest and the most individualized and direct forming method. Wares can be constructed by hand from coils of clay, from flat slabs of clay, from solid balls of clay—or some combination of these. Parts of hand-built vessels are often joined together with the aid of slurry or slip, a runny mixture of clay and water acting like a glue to stick pieces together. Handbuilding is slower and more gradual than wheel-throwing, but it offers the potter a high degree of control over the size and shape of wares. While it is not difficult for an experienced potter to make identical pieces of hand-built pottery, the speed and repetitiveness of wheel-throwing is more suitable for making precisely matched sets of wares such as table wares. Some potters find handbuilding more conducive to fully using the imagination to create one-of-a-kind works of art, while other potters find the spontaneity and immediacy of wheel-thrown pottery as their source of inspiration. Throwing on the potter's wheel. 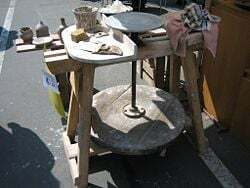 A ball of clay is placed in the center of a turntable, called the wheel-head, which the potter rotates with a stick, or with foot power (a kick wheel or treadle wheel) or with a variable speed electric motor. Often, a disk of plastic, wood or plaster—called a bat—is first set on the wheel-head, and the ball of clay is thrown on the bat rather than the wheel-head so that the finished piece can be removed intact with its bat, without distorting the pot. During the process of throwing, the wheel turns rapidly while the solid ball of soft clay is pressed, squeezed, and pulled gently upwards and outwards into a hollow shape. The first step, of pressing the rough ball of clay downward and inward into perfect rotational symmetry, is called centering the clay, a most important (and often most difficult) skill to master before the next steps: opening (making a centered hollow into the solid ball of clay), flooring (making the flat or rounded bottom inside the pot), throwing (drawing up and shaping the walls to an even thickness), and trimming or turning (removing excess clay to refine the shape or to create a foot). 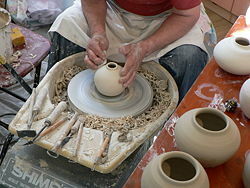 The potter's wheel can be used for mass production, although often it is employed to make individual pieces. Wheel-work makes great demands on the skill of the potter, but an accomplished operator can make many near to identically similar plates, vases, or bowls in the course of a day's work. Because of its inherent limitations, wheel-work can only be used to create wares with radial symmetry on a vertical axis. These can then be altered by impressing, bulging, carving, fluting, faceting, incising, and by other methods making the wares more visually interesting. 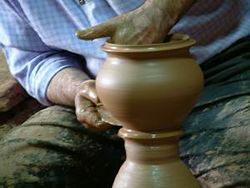 Often, thrown pieces are further modified by adding handles, lids, feet, spouts, and other functional aspects and by using the techniques of handworking. Molding clay in commercial wares. Slipcasting is often used in the mass-production of ceramics and is ideally suited to the making of wares that cannot be formed by other methods of shaping. A slip, made by mixing a clay body with water, is poured into a highly absorbent plaster mold. Water from the slip is absorbed into the mold leaving a layer of clay body covering its internal surfaces and taking its internal shape. Excess slip is poured out of the mold, which is then split open and the molded object removed. Slipcasting is widely used to produce identical shapes in the production of sanitary wares, dinnerware and is also used for making smaller articles, such as intricately-detailed figurines. Molding or granulate pressing. As the name suggests, this is the operation of shaping pottery by pressing clay in a semi-dry and granulated condition in a mold. The clay is pressed into the mold by a porous die through which water is pumped at high pressure. The granulated clay is prepared by spray-drying to produce a fine and free flowing material having a moisture content of between about five and six percent. Granulate pressing, also known as dust pressing, is widely used in the manufacture of ceramic tiles and, increasingly, of plates. Jiggering and jolleying. These techniques are carried out on the potter's wheel and shorten the time needed to bring wares to a standardized form. Jiggering is the operation of bringing a shaped tool into contact with the plastic clay of a piece under construction, the piece itself being set on a rotating plaster mold on the wheel. The jigger tool shapes one face, while on the other side, the mold shapes the other. Jiggering is used only in the production of flat wares, such as plates. The similar operation known as jolleying, is used in the production of hollow wares, such as cups. Jiggering and jolleying have been used in the production of pottery since at least the eighteenth century. In large-scale factory production, jiggering and jolleying are usually automated, which allows the operations to be carried out by semi-skilled labor. Roller-head machine. This machine is for shaping wares on a rotating mold, as in jiggering and jolleying, but with a rotary shaping tool replacing the fixed profile. The rotary shaping tool is a shallow cone having the same diameter as the ware being formed and shaped to the desired form of the back of the pot being made. Wares may in this way be shaped, using relatively unskilled labor, in one operation at a rate of about twelve pieces per minute, though this varies with the size of the articles being produced. The roller-head machine is now used in factories worldwide. RAM pressing is a factory process for shaping table and decorative wares by pressing a bat of a prepared clay body into a required shape between two porous molding plates. After pressing, compressed air is blown through the porous mold plates to release the shaped wares. Firing in a kiln produces irreversible changes in the body. It is only after firing that the article can be called pottery. In lower-fired pottery, the changes include sintering, the fusing together of coarser particles in the body at their points of contact with each other. In the case of porcelain, where different materials and higher firing-temperatures are used, the physical, chemical and mineralogical properties of the constituents in the body are greatly altered. In all cases the object of firing is to permanently harden the wares and the firing regime must be appropriate to the characteristics of the materials used to make them. There are two types of pottery—earthenware and stoneware—and these are a result of the different temperatures of firing. As a rough guide, earthenware is normally fired at temperatures of about 1,800 to 2,000 °F; and stoneware at 2,370 to 2,370 °F. Earthenware is porous, and the glaze is "melted" or fused onto its surface in the kiln. But at around 2,100 °F the clay begins to "vitrify" or become fused together as a solid, nonporous mass, with the glaze and clay becoming one. Only then is it called "stoneware" which is denser and heavier than earthenware. Porcelain is very thin, and pure stoneware is often translucent and light in weight. An oxidizing atmosphere, produced by allowing air to enter the kiln, can cause the oxidation of clays and glazes. A reducing atmosphere, produced by limiting the flow of air into the kiln, can strip oxygen from the surface of clays and glazes. This can affect the appearance and color of the wares being fired and, for example, some glazes containing iron fire brown in an oxidizing atmosphere, but green in a reducing atmosphere. 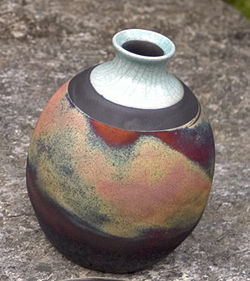 The atmosphere within a kiln can be adjusted to produce complex effects in glaze. In an Anagama kiln, built into a hillside, the burning wood not only produces heat—up to 2,500 °F (1,400 °C)—it also produces fly ash and volatile salts. Wood ash settles on the pieces during the firing, and the complex interaction between flame, ash, and the minerals comprising the clay body forms a natural ash glaze. This glaze may show great variation in color, texture, and thickness, ranging from smooth and glossy to rough and sharp. 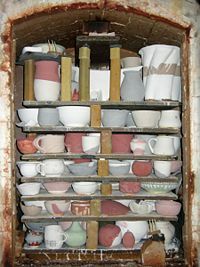 The placement of pieces within the kiln distinctly affects the pottery's appearance, as pieces closer to the firebox may receive heavy coats of ash, or even be immersed in embers, while others deeper in the kiln may only be softly touched by ash effects. Other factors that depend on the location include temperature and oxidation/reduction. Besides location in the kiln, (as with other fuel fired updraft kilns) the way pieces are placed near each other affects the flame path and thus, the appearance of pieces within localized zones of the kiln can vary as well. It is said that loading an anagama kiln is the most difficult part of the firing. The potter must imagine the flame path as it rushes through the kiln, and use this sense to paint the pieces with fire. Kilns may be heated by burning wood, coal and gas, or by electricity. When used as fuels, coal and wood can introduce smoke, soot and ash into the kiln which can affect the appearance of unprotected wares. For this reason wares fired in wood or coal-fired kilns are often placed in the kiln in saggars—lidded ceramic boxes—to protect them. 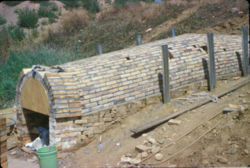 Modern kilns powered by gas or electricity are cleaner and more easily controlled than older wood or coal-fired kilns and often allowing shorter firing times. There is both a gradual increase and a gradual decrease of temperature between the firing time at a specific temperature. Firing must be strictly and patiently controlled to produce the desired affects. Yet, there is always anxiety on the part of the artist concerning the results of the final firing of wares. Many hopes have been dashed by the "kiln god." In a Western adaptation of traditional Japanese raku firing, wares are removed from the kiln while hot and smothered in ashes, paper, leaves, woodchips, or other organic materials which produces a distinctive carbonized appearance. The ancient style of pit firing—where the wares are covered up in a burning pit and allowed to fire over a slow time period—is still used today by some artisans and in primitive areas, though the results are difficult to control. Glaze is a glassy coating applied to pottery, the primary purposes includes decoration and protection. Glazes are highly variable in composition but usually comprise a mixture of ingredients that generally, but not always, mature at kiln temperatures lower than that of the pottery that it coats. One important use of glaze is in rendering pottery vessels impermeable to water and other liquids. Glaze may be applied by dusting it over the clay, spraying, dipping, trailing or brushing on a thin slurry composed of glaze minerals and water. Brushing tends not to give an even covering but can be effective as a decorative technique. 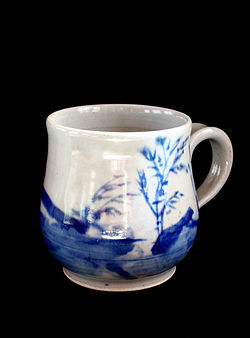 The color of a glaze before it has been fired may be significantly different than afterwards. To prevent glazed wares sticking to kiln furniture during firing, either a small part of the object being fired (for example, the foot) is left unglazed or, alternatively, special refractory spurs are used as supports. These are removed and discarded after the firing. Special methods of glazing are sometimes carried out in the kiln. 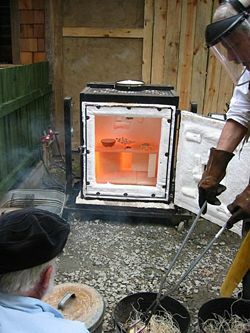 One example is salt-glazing, where common salt is introduced to the kiln to produce a glaze of mottled orange peel texture. Materials other than salt are also used to glaze wares in the kiln, including sulfur. In wood-fired kilns, fly-ash from the fuel can produce ash-glazing on the surface of wares. Underglaze is a method of decorating ceramic articles, the decoration is applied to the surface before it is glazed. Because the glaze will subsequently cover it such decoration is completely durable, but because the subsequent glost firing is at a higher temperature than used in on-glaze decoration the range of available colours is more limited. It uses pigments derived from oxides which fuse with the glaze when the piece is fired in a kiln. Examples include blue and white and İznik pottery. Enamelling, enamel (or vitreous enamel or porcelain enamel in U.S. English) is the colorful result of fusing powdered glass to a substrate by firing, usually between 1300° - 1600°F. The powder melts and flows and hardens to a smooth, durable vitreous coating on metal, glass or ceramic. It often is applied as a paste, and may be transparent or opaque when fired. Incising patterns in the clay body's surface. Agateware: So-named after its resemblance to the quartz mineral agate which has bands or layers of color that are blended together. Agatewares are made by blending clays of differing colors together, but not mixing them to the extent that they lose their individual identities. The wares have a distinctive veined or mottled appearance. The term 'agateware' is used to describe such wares in the United Kingdom; in Japan the term neriage is used, and in China, where such things have been made since at least the Tang Dynasty (600-900 C.E. ), they are called marbled wares. Great care is required in the selection of clays to be used for making agatewares as the clays used must have matching thermal movement characteristics. Banding: This is the application, by hand or by machine, of a band of color to the edge of a plate or cup. Also known as lining, this operation is often carried out on a potter's wheel or turnstile. Burnishing: The surface of pottery wares may be burnished prior to firing by rubbing with a suitable instrument of wood, steel or stone, to produce a polished finish that survives firing. It is possible to produce very highly polished wares when fine clays are used, or when the polishing is carried out on wares that have been partially dried and contain little water, though wares in this condition are extremely fragile and the risk of breakage is high. Engobe: This is a clay slip, often white or cream in color, that is used to coat the surface of pottery, usually before firing. Its purpose is often decorative, though it can also be used to mask undesirable features in the clay to which it is applied. Engobe slip may be applied by painting or by dipping, to provide a uniform, smooth, coating. 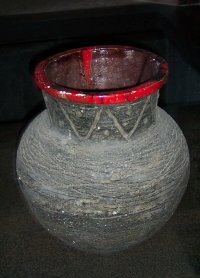 Engobe has been used by potters from pre-historic times until the present day, and is sometimes combined with sgraffito decoration, where a layer of engobe is scratched through to reveal the color of the underlying clay. With care it is possible to apply a second coat of engobe of a different color to the first and to incise decoration through the second coat to expose the color of the underlying coat. 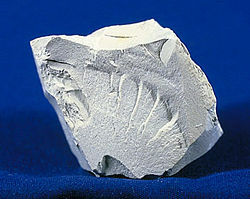 Engobes used in this way often contain substantial amounts of silica, sometimes approaching the composition of a glaze. Litho: This is a commonly used abbreviation for lithography, although the alternative names of transfer print or decal are also common. These are used to apply designs to wares. The litho comprises three layers: the color, or image, layer which comprises the decorative design; the covercoat, a clear protective layer, which may incorporate a low-melting glass; and the backing paper on which the design is printed by screen printing or lithography. There are various methods of transferring the design while removing the backing-paper, some of which are suited to machine application. Best gold – a suspension of gold powder in essential oils mixed with a flux and a mercury salt extended. This can be applied by a painting technique. From the kiln the decoration is dull and requires burnishing to reveal the full color. Acid gold – a form of gold decoration developed in the early 1860s at the English factory of Mintons Ltd, Stoke-on-Trent. The glazed surface is etched with diluted hydrofluoric acid prior to application of the gold. The process demands great skill and is used for the decoration only of ware of the highest class. Bright gold – consists of a solution of gold sulphoresinate together with other metal resinates and a flux. The name derives from the appearance of the decoration immediately after removal from the kiln as it requires no burnishing. Mussel Gold – an old method of gold decoration. It was made by rubbing together gold leaf, sugar and salt, followed by washing to remove solubles. So far as is known, the earliest pottery wares were hand-built and fired in bonfires. Firing times were short but the peak-temperatures achieved in the fire could be high, perhaps in the region of 1700 °F, and were reached very quickly. Clays tempered with sand, grit, crushed shell or crushed pottery were often used to make bonfire-fired ceramics, because they provided an open body texture that allowed water and other volatile components of the clay to escape freely. The coarser particles in the clay also acted to restrain shrinkage within the bodies of the wares during cooling, which was carried out slowly to reduce the risk of thermal stress and cracking. Early bonfire-fired wares were made with rounded bottoms, to avoid sharp angles that might be susceptible to cracking. 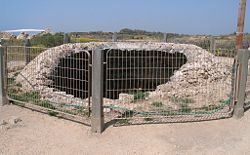 The earliest purpose-built kilns were pit-kilns or trench-kilns, and were holes dug in the ground and offered better control over firing. 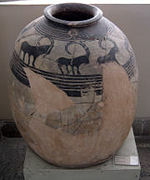 Iranian Sialk pot, c. 4000 B.C.E. It is believed that the earliest known ceramic objects are Gravettian figurines such as those discovered at Dolni Vestonice in the modern-day Czech Republic. The Czech figurines, which include the well-known Venus of Dolni Vestonice were made about 25,000 years ago. The earliest known pottery vessels may be those made by the Incipient Jomon people of Japan around 10,500 B.C.E. Pottery dating back to 10,000 B.C.E. has also been excavated in China. It appears that pottery was independently developed in North Africa during the tenth millennium B.C.E. and in South America during the seventh millennium B.C.E. The invention of the potter's wheel in Mesopotamia sometime between 6000 and 4000 B.C.E. (Ubaid period) revolutionized pottery production. Specialized potters were then able to meet the burgeoning needs of the world's first cities. For archaeologists, anthropologists and historians, the study of pottery can help to provide an insight into past cultures. Pottery is durable and fragments, at least, often survive long after artifacts made from less-durable materials have decayed past recognition. Combined with other evidence, the study of pottery artifacts is helpful in the development of theories on the organization, economic condition and the cultural development of the societies that produced or acquired pottery. The study of pottery may also allow inferences to be drawn about a culture's daily life, religion, social relationships, attitudes towards neighbors, attitudes about their own world and even the way the culture understood the universe. Chronologies based on pottery are often essential for dating non-literate cultures and are often of help in the dating of historic cultures as well. Trace element analysis, mostly by neutron activation, allows the sources of clay to be accurately identified and the thermoluminescence test can be used to provide an estimate of the date of last firing. Examining fired pottery shards from prehistory, scientists learned that during high-temperature firing, iron materials in clay record the exact state of the Earth's magnetic field at that exact moment. ↑ John H. Lienhard, The Dolni Vestonice Ceramics. University of Houston’s “Engines of Our Ingenuity.” Retrieved September 4, 2007. ↑ Jared Diamond, “Human Evolution: Japanese Roots,” Discover (June 1, 1998). Retrieved September 4, 2007. ↑ Simon Kaner, “The Oldest Pottery in the World,” Current World Archeology 1 (September 2003): 44-49. Retrieved September 4, 2007. ↑ Zjang Chi, “Discovery of early pottery in China,” Peking University Department of Archeology. Retrieved September 4, 2007. ↑ William Barnett and John Hoopes (eds. ), The Emergence of Pottery (Washington, DC: Smithsonian Institution Press, 1995, ISBN 1560985178), 23. ↑ Barnett & Hoopes, 211. ↑ Nova: Magnetic Storm, PBS. Retrieved September 4, 2007. Childe, V. G. (1951). Man Makes Himself. London: Watts & Co.
Kirkpatrick, Christian. "Potteries of Staffordshire." British Heritage. Available online from TheHistoryNet. Retrieved September 4, 2007. This page was last modified on 27 May 2015, at 20:53.